MASSIVE VOODOO: NOVA OPEN 2017 Reminder! the NOVA OPEN 2017 is ready and event registration is open. 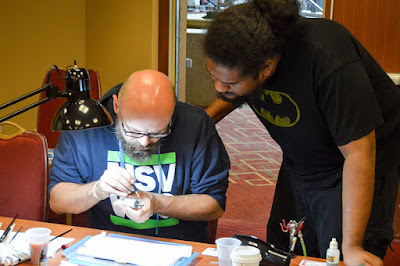 MV's Roman will be there again to teach some high quality and fun seminars and also help to judge the capital palette. This will be a great time for sure again in Washington D.C. There are 2 Kommentare for NOVA OPEN 2017 Reminder! I am taking 2 classes from you at the NOVA Open this year (Blending School and Display painting.) I am thrilled to be able to learn from you in person, especially since I have gotten so much out of the tutorials you and the rest of the Massive Voodoo team have produced. For Blending School, is there anything I should be practicing in particular? I am not very good at blending so any tips or pointers to practice before the class would be appreciated. Hi Michael, first of all do not worry too much. I recommend to take the free 1 hour display painting introduction class at least once by me at the NOVA. This gives you all basic theory you need for the blending class. Nothing to practice right now I'd say. 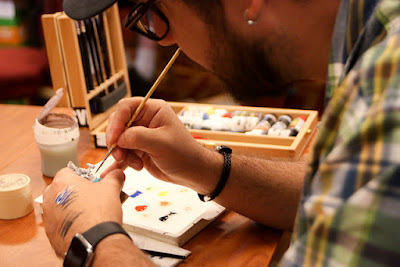 Blending is not a technique, blending is the result of a technique and there are tons of techniques that I will explain in this class, you can paint a good blending with your fingers ... looking forward to help you soon!